Early this year, on a brisk but clear morning in Chelyabinsk, Russia, a chunk of rock half the diameter of the ill-fated Hindenburg entered the atmosphere and exploded. With a velocity of over Mach 60, the meteor carried with it more energy than some nuclear bombs. Luckily, only a small part of this energy was transferred to the residents of Chelyabinsk below. Still, the ensuing kinetic tsunami damaged over 7,000 buildings and injured over 1,000 people. It was the biggest object to enter our skies in over a hundred years—literally a once-in-a-lifetime event. Thanks to today’s technology, and the interesting ubiquity of Russian dashboard cameras, thousands saw it and science confirmed it. Late night on a dirt road, a man in a pickup truck flips on his high beams. The road is uneven and shaky, insects on errant paths ping off the headlights, stars flicker in the sky. But one star doesn’t flicker quite right. The man brings his truck to a slow crawl, to stop his bumping and bobbing. An object moves at an unnatural speed towards him. It stops above him emitting an eerie glow. In a flash, it disappears into the dark of space faster than he can blink. He just had an encounter with an alien—a once-in-a-lifetime event. No one else saw it. In the middle of summer last year, our planetary neighbor Venus passed in front of the Sun. This cosmic walk lasted but eight hours, obscure to anyone without eye protection. This too was a once-in-a-lifetime event. Even the lucky future centenarians among us probably won’t live to see the next transit. Thousands, maybe millions saw it and science confirmed it. Shadowed by the growing stalks of his crops, a restless farmer wakes to a disturbing sight. In the middle of his field, a geometric and cryptic pattern has flattened a good percentage of his livelihood. He will go to the paper to report an alien visitation that neither he nor anyone else actually saw, and no one could confirm. We project our own hopes and fears, questions and answers, onto the cosmos. With eyes always on the skies, whatever comes through has profundity. Ages ago, these sights were the objects of prophecy and myth. Some still are. Thanks to modern science, many of space’s mysteries are known to be eclipses or comets or meteors or solar flares. We are the watchers. Events are scribbled in personal journals and official histories, spoken between friends and now shared on the Internet. In fact, today is the best time in our short history to glimpse and identify the mysterious tendrils that reach into our home from space. It’s the best time to verify who is watching the watchers. If aliens really did visit Earth, we would quickly confirm their presence with the most distributed evidence in the history of human sharing. “Viral” wouldn’t even begin to describe it. That evidence wouldn’t languish in the cabinet of some military bureaucrat. It would mark the person or government that changed the world. 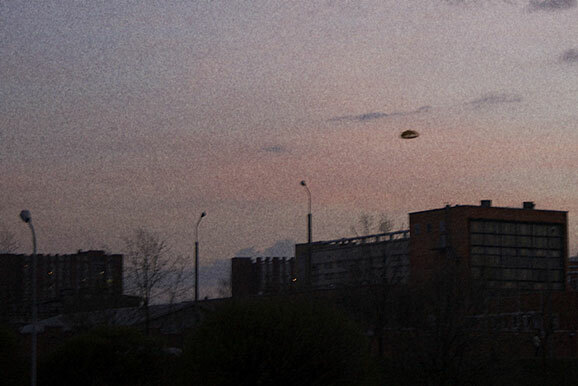 According to the National UFO reporting center, there are hundreds or even thousands of UFO sightings around the world each year. It reports over 6,600 sightings just in the last ten months. That’s around twenty-two sightings per day—the same as if 1 percent of all daily domestic flights in the US were UFOs. If aliens really were visiting us, such a number of sightings would provide ample evidence to confirm their existence—enough evidence to rule out a planet, lens flare, or plane. As in Chelyabinsk, video cameras mounted on dashboards, recessed in phones, and lining our streets would capture these rather common events for analysis. YouTube and other file sharing sites would be inundated with less than blurry and definitely not “shopped” examples of alien visitors. Scientists would descend on the locales—as they did in Russia—retracing flight paths, calculating velocities, and estimating masses (all from YouTube videos!). When millions of people each day have the opportunity to use the miniaturized computers in their pockets to capture events much more common than giant meteors, you wouldn’t have to “want to believe” any more. If we really have made contact with an extraterrestrial species, those who have would quickly shake off the “wingnut” stereotypes lobbed against them. They would literally be some of our best and brightest. Speaking with aliens ain’t easy. The chances that human technology is on par with a species that has been around long enough to overcome the perils of interstellar travel are effectively zero. Aliens won’t speak any of our languages, know any of our scientists or icons, and they probably wont see, gesture, or speak in any recognizable way. The incredibly clever individuals who have made contact would be able to speak in a way any scientifically advanced species may recognize—the language of relativity, evolution, and mathematics. Universally known constants like the speed of light and the charge of an electron would be known by heart. They would be able to converse like Einstein or theorize like Pythagoras. A government conspiracy to cover up alien visits wouldn’t be. Any government that acknowledged (and took credit for) first contact would likely become the most important institution in human history—the official ambassador to space. That institution would serve as our spokesperson, and be the one who would have to demonstrate the value, in its entirety, of humanity. The summation of our knowledge and our art and our morality would be conveyed through this body. If the aliens are a part of a larger contingent of space-faring species (perhaps a kind of federation…), then the government who had the actual evidence and acknowledged first contact could define the most pivotal moment since our split from ape ancestors. It would fall on them to demonstrate our worth, to pass the test of cosmic awareness, and, if our worst fears are founded, to defend us from an extra-terrestrial foe. Either way, there would be few reasons why a person or government would not want the singular power to define history as pre- and post-contact. But instead of verifying the most important evidence humanity could ever get, we see blurry (and doctored) photos and videos, listen to disparate anecdotes and lucid dreams, and never receive anything nearly as clear as the evidence Chelyabinsk witnessed. When a once-in-a-hundred-years object comes through the atmosphere above Russia and lingers for only a few seconds before disappearing, within hours scientists have trajectories and velocities. With a handful of UFO sightings every day, we get nothing. No unexpected interference in transmissions, TV broadcasts, radio signals, or Wi-Fi strengths. No physical sign of entry or exit. No contact with anyone who could do something about it. Of course, an advanced race of aliens may go about us as unnoticed watchers—it is possible. Maybe they have some Prime Directive they must follow. But the evidence to say that we are watching them back is just not there. It’s almost statistically impossible that life does not exist elsewhere in the universe (or other universes), but at the same time, given the evidence we do not have, evidence that could confirm a meteor strike or enemy aircraft in our airspace or an alien craft, the idea that aliens constantly visit us can be reduced to the absurd.